The dichotomy at times is hard to fathom. 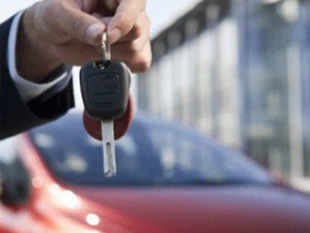 The India auto industry closed 2012-13 with a sales dip of 6.7%, the first drop in 12 years. The outlook for 2013-14 isn't much brighter, with industry experts and analysts predicting a growth of 3-5%. Over the past decade, the demand and hence the manufacturing landscape in the auto world has begun shifting from the developed to the emerging world. Yet talk to top honchos of auto MNCs and you get a different picture. Honda sees India as an important leg on which global growth rests. Ford Motors CEO Joginder Singh says the Detroit carmaker remains buoyant about the country's long-term potential. Ditto for Nissan and Toyota. The apparent disconnect between the sales slowdown in India today and auto MNCs' long-term ambitions has a good explanation. Over the past decade, the demand and hence the manufacturing landscape in the auto world has begun shifting from the developed to the emerging world. According to estimates of Brooking Institution, a US public policy research organisation, the US' and Europe's share of the world's middle class — today at around 50% — will dip to 22% by 2030. In Asia, it will more than double from 30% to 64% by then. This shift is already reflected in the automobile industry. About a decade back, in 2002, Asia's contribution to global production capacity in the automobile industry was 15-20%. Today it accounts for over half. 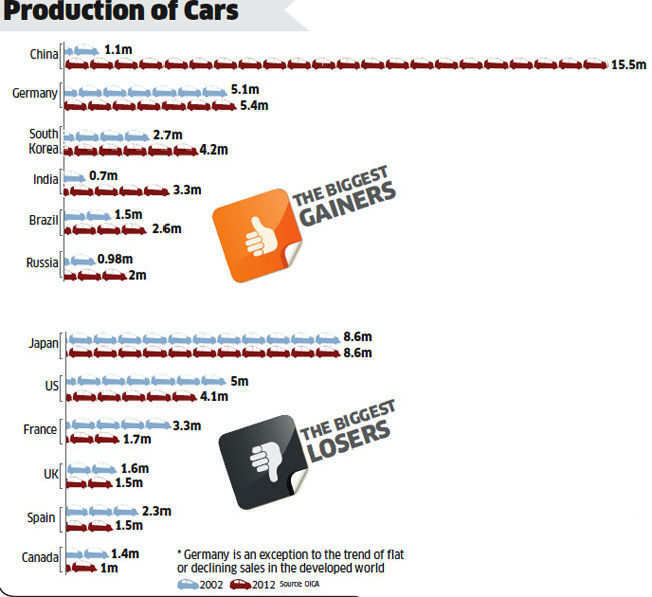 China has become the top country in car sales, beating the US. 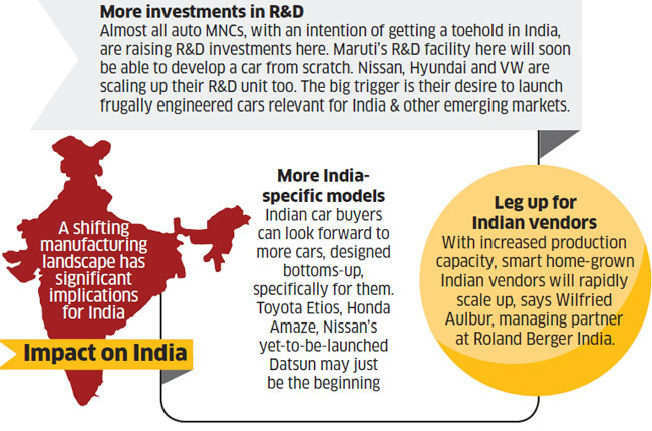 Auto MNCs, lured by this huge growth potential, are shifting production bases to Asia to be closer to their customers. India with a capacity to produce 3 million cars is the third largest. With vehicle penetration in India at a low 13 per 1,000 people (compared to 45 per 1,000 for China) and a growing young population, it should soon overtake Korea as the second-largest car producer in Asia, after China. Almost all auto companies are looking to reduce the manufacturing complexity in their product portfolio. They are laying thrust on global platforms — using the same base globally to churn out a range of vehicles. For example, Volkswagen's Polo (a compact) and Vento (a sedan) are based on the same platform. It is now also developing a sub-four metre Vento — on the same platform — specifically for India. It is reportedly considering an MPV and a compact SUV on the same platform. Increasingly the auto world is seeing a global convergence of the product lifecycle. More and more auto firms are now doing global launches of their products in different markets and also phasing them out simultaneously. For example, Ford EcoSport will soon debut in India as part of its global launch. "As platforms become globalised, there is less pressure to locate production close to any one market. We're seeing surprisingly strong manufacturing centres developing in North America, particularly the US and Mexico. Of course China, Korea, parts of Southeast Asia and Europe will continue to be strong production hubs," says US-based Jeremy Anwly, vicechairman of Edmunds.com, an auto advisory portal. It helps that production costs in most developed countries like the US, Japan and most western European countries are sharply higher than the emerging markets. Perhaps the only exception is Germany which has maintained its manufacturing edge due to its relentless focus on technology, its thriving manufacturing ecosystem and its focus on high-end cars. As a result, auto MNCs are shifting their production bases from high-cost economies like the US and western Europe to low-cost countries like China and India. Analysts estimate that producing cars in India today may be 15-20% cheaper than in the US. In fact, there are many countries like the Czech Republic and Argentina — with no primary domestic demand — which are emerging as low-cost export hubs for the regions. "Rather than setting up duplicate production bases, OEMs are increasingly seeking to gain efficiencies and scale by establishing a production base in the most efficient place — where they can minimise cost and maximise revenue," says Beijing-based Bill Russo, senior adviser, Booz & Company, a consultancy firm. Many countries are signing regional or bilateral free-trade agreements (FTAs). The US has signed one with Mexico, India has signed with the Southeast Asian countries. India's FTA with EU though has run into a controversy. The US has signed FTAs with a range of countries, including Mexico which is fast emerging as a car export hub in North America. Turkey is also emerging as production hub, partly due to its FTA with countries like Korea. At a macro level, there is some convergence of the kind of vehicles that consumers in different markets need. Europebased Mark Fulthorpe, senior manager, IHS Global, says environmental and efficiency norms in different countries today are much closer than they ever were in the past. This means companies have to align their cars with policy norms that are in a much narrower band. Also, globally, there is a clear shift in consumers' preference for smaller, compact and fuel-efficient vehicles, says Haig Stoddard, a veteran auto analyst with US-based Ward's Auto. All this means that auto MNCs have to deal with a far less heterogeneous policy environment and consumer demand — allowing them more room to pick their production location.